[Updated November 17, 2012] Hemisphere GPS, the latest incarnation of a home-grown Canadian company, has announced plans to close its Calgary, Alberta, headquarters and exit the OEM GNSS business, and is currently seeking a buyer for its Precision Products and R&D assets. The company will focus exclusively on the precision agriculture market under its new CEO Rick Heiniger. In pursuing its new strategy, the company will lay off more than 100 employees and contractors in Calgary, reducing its workforce from 273 to about 170. Of the reduction in workforce, approximately 40 employees are associated with the GNSS precision products division. Hemisphere GPS will relocate its corporate headquarters to Hiawatha, Kansas, the current center for its agricultural operations under the Outback Guidance brand. Phil Gabriel, the company’s vice-president and general manager for the precision products, told Inside GNSS that the company is "negotiating with several interested investors and expect to close on that early in Q1," Gabriel said. "At that point we will become a separate business, likely maintaining the Hemisphere GPS brand since the Ag group have always used Outback branding. For now, it is business as usual. " Gabriel added that the 100-person reduction affects half production and corporate staff based in Calgary and will take place over the Q1 and Q2 2013 period. "The balance is our group and the Core GNSS Development team, which are not being laid off, but rather will go with the sale," he said. "Precision will likely be maintaining facilities in Calgary and Scottsdale." The moves followed the latest of a series of continuing losses in recent years. The company’s third quarter financial report showed that Hemisphere GPS incurred a loss of $2.8 million, compared to a loss of $1.6 million in the year-earlier period. The company was founded in 1990 as Canadian Systems International (CSI) Inc. (later Communications System International, and then CSI Wireless), by Stephen Verhoeff who served as CEO until 2006. In 1996 CSI concluded a $6-million initial public offering of CSI shares on Toronto Stock Exchange. Its share price peaked at CN$9.50 in 2000, but was trading at CN$0.68 today (November 16, 2012). Over the years, the company designed and manufactured a variety of OEM and end user GNSS products for positioning, guidance, and machine control applications in agriculture, marine, survey, construction, and other markets. In the last two years, the company had developed ever-smaller OEM boards, including the dual-frequency miniEclipse. 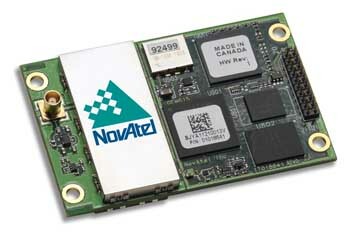 Nonetheless, the company faced stiff competition for GNSS OEM form factors, including such large enterprises as nearby NovAtel, Inc., Trimble, and Topcon. GNSS precision products — both OEM and non-agricultural end user equipment — contributed 25 percent of Hemisphere GPS’s total revenue in the third quarter of 2012 compared to 29 percent in 2011. In the same period, revenue from the Precision Products business declined to $3.5 million from $4.1 million. An investment banking firm has been engaged to pursue “strategic alternatives” for the precision products business. “Given the agricultural focus of the Company, the Board believes that the Precision Products business can grow more quickly with another organization that is more strategically aligned,” according to a press release issued by Hemisphere GPS. Despite its long history developing proprietary products in the GNSS field, Hemisphere also had a long-standing connection to the agriculture sector, for which it offered precision farming solutions. In 1999, then-CSI acquired Satloc Inc., an Arizona company that had developed an aerial- and ground-based guidance system used primarily for chemical spray applications. In 2005, CSI acquired the Outback Guidance business of RHS Inc., founded by Heiniger in 1980 as a distributor of supplies for fertilizing and spraying in Northeast Kansas. Heiniger joined the Hemisphere GPS board of directors in 2005 and became vice-chairman the following year. Heiniger moved up to president and CEO in September 2012, replacing Steve Koles who had held that position for six years. Heiniger is a past President of the North American-wide Farm Equipment Manufacturers Association, and is the founder and principal of Bestway Inc., a specialty agricultural equipment manufacturer and marketer. Copyright © 2012 Gibbons Media & Research LLC, all rights reserved.